Arab pizza? Yes this flat bread is baked with a delicious topping and looks like pizza. Known as Lahmajun in Armenia, Lahm Bi-A'jin in Syria and Lebanan and Sfiha in Jordan, this flat bread with a meat mince topping is as good as the regular pizza although the flavour profile is entirely different. More earthy, more filling and completely a different experience than the regular Italian pizza, although the looks are similar. But then we know so many versions of flat breads around the globe that it feels very natural to find similar looking recipes in one corner of the globe with an interesting bunch of flavours. This Lahm Bi-A'jin is one of those recipes. One can make a vegetarian version with crumbled paneer or a thick tomato sauce or mashed eggplants and cheese or with any topping one can imagine as this bread is quite easy to make. I found it here some time ago, adjusted it to my taste and have been making Lahm Bi-a'jin since then. Sometimes I fold the bread like a calzone for the ease of packing it into the lunch box of the husband. 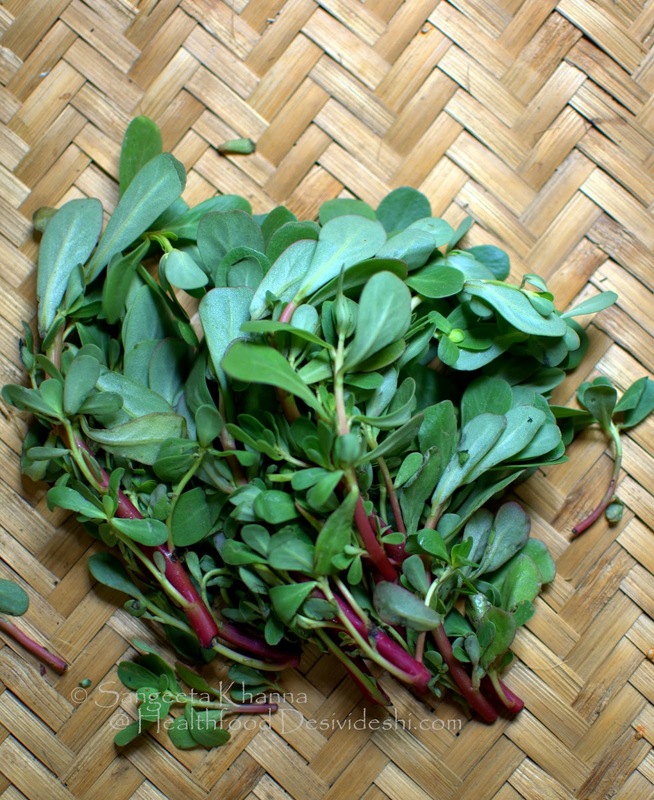 This time I cooked it using the most nourishing greens of the season, Purslane. I have been using purslane to make pizza sauce sometimes but adding it to minced meat and flavouring it with Za'atar was such a brilliant idea. The minced meat and purslane mix was just too good to resist. Dusted generously with home made Za'atar. Ingredients for the flat bread base will be similar to any standard pizza base recipe you use. I used my standard whole wheat bread recipe for the dough. Roll out flat breads of any size and spread the cooked mutton mince mixture over them and bake till the flat bread is pinkish brown on the edges and the mince mix is sizzling. Pour the olive oil in a heavy base pan and tip in the minced garlic and red chilly flakes and then place the pan over stove. As the oil starts sizzling add the finely chopped purslane greens along with salt and stir fry till the purslane wilts. Add the minced meat and thyme leaves, mix well and cook covered on medium heat till the mince is cooked, the purslane greens get almost homogenized with the mince, changing it's colour and appearance. Adjust seasoning and add the toasted sesame powder, dehydrate the mixture so it doesn't ooze liquids on the pizza base. Spread a generous mince mixture over a rolled out thin bread base and bake for 10 minutes at 200 C on the middle rack. Keep an eye on the pizza as it can get burnt or stay raw in the middle. 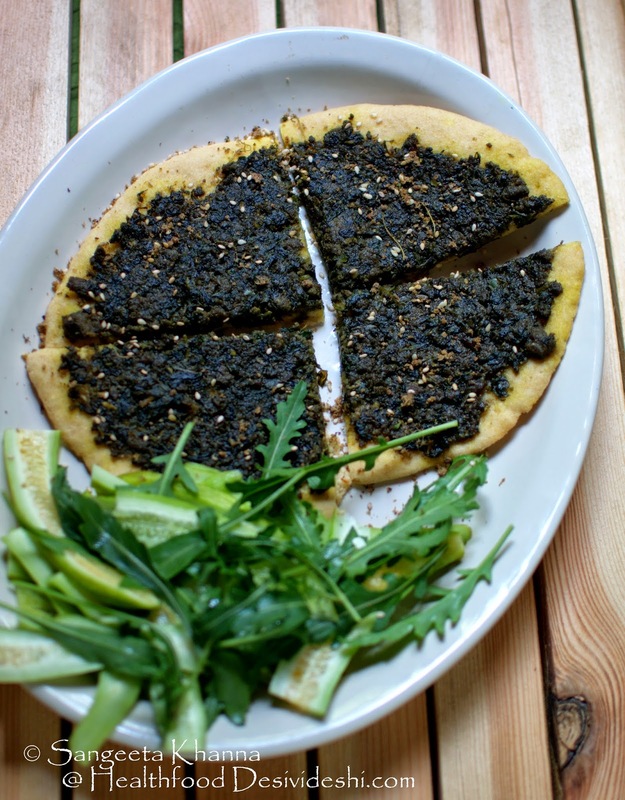 Sprinkle Za'atar over the hot Arab pizza along with some more toasted sesame if you like and serve hot with some green salad on the side. 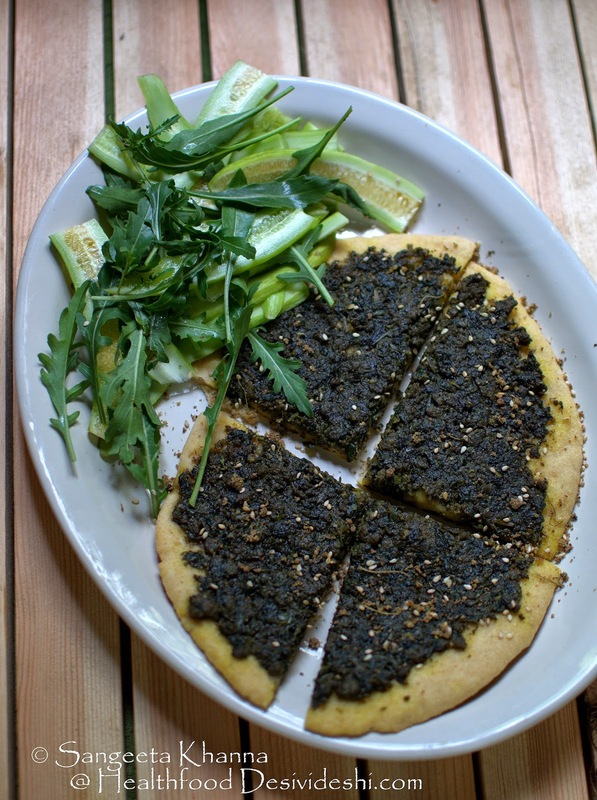 The minced meat and purslane along with Za'atar make a very interesting flavour base together. I have been cooking this purslane and keema scramble even as an everyday curry for ourselves. I keep it a bit moist or even runny if I am planning to serve it along with roti or paranthas. 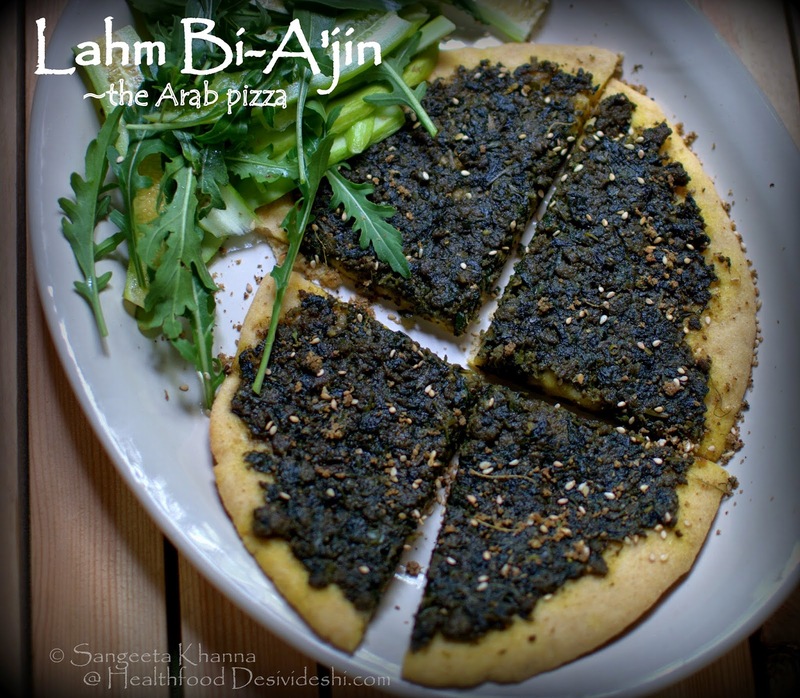 I am sure Lahm Bi-A'jin will become a new favourite pizza the day you cook it. Especially if you have a carnivore family. Make it using paneer scramble with spinach or purslane if you are a vegetarian but don't forget to sprinkle a generous handful of Za'atar over it. If you don't have Za'atar you can coarsely powder fresh thyme leaves, coarse sea salt, toasted sesame seeds and sumac (or dried limes). It works nicely with this recipe or on plain flat breads too.